Mathematician Carlos Castillo-Chavez says that pi is so important to math that using its simple, geometric definition denies its greater powers. "[Pi] brings you into the world of mathematics, which is magic, mysterious and exciting and always full of challenges for everybody," Castillo-Chavez said. First calculated 4,000 years ago, pi represents the ratio of a circle's circumference to its diameter. You learned it as 3.14, which is why today some take the chance to bask in the brilliance and beauty of the mathematical constant, while others try to tear it down. Castillo-Chavez is firmly in the pro-pi camp. He studies epidemics at Arizona State University, and he says pi is used to study everything that cycles — waves and heart pulses and anything that recurs. In his own work, Castillo-Chavez uses pi to try to understand why certain strains of influenza seem to reappear every 20 years. In math, he says, pi pops up in the most unexpected places. "Pi, with its infinite number of digits, is an introduction to the kinds of mathematics that we do, which often involve the study of infinite processes," Castillo-Chavez said. What's more, Castillo-Chavez says that pi is most people's introduction to a mind-blowing concept invented by Georg Cantor that says there is a hierarchy of infinities. In simple terms, the infinity in between numbers is larger than the infinity of, say, countable numbers. Pi, whose decimals extend into infinity, opens up that parable, says Castillo-Chavez. 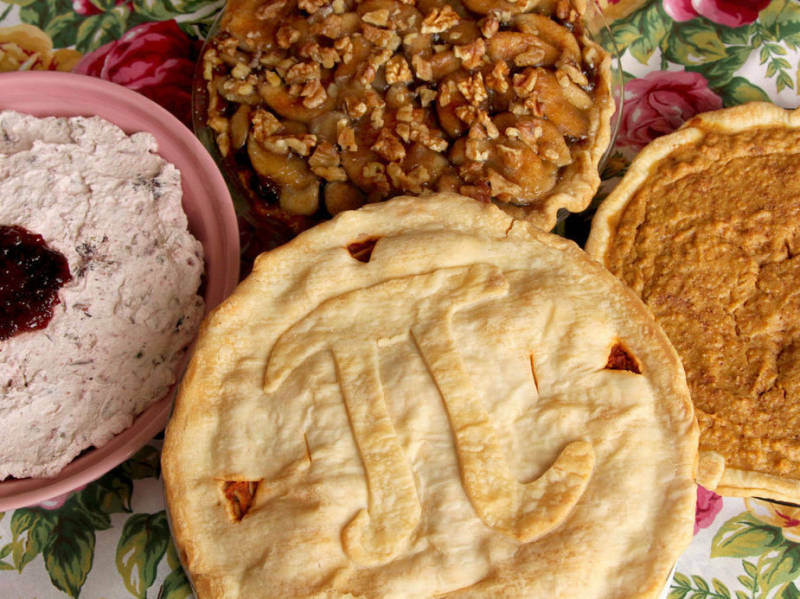 YouTube star Vi Hart, who calls herself a recreational mathematician, is not impressed with pi. She's made it a habit of posting anti-pi videos on Pi Day. "Pi is not special," she says in one. "Yeah, pie can be fun and I'd never deny you your desserts, but maybe try some real food every once in a while." Her beef? She says there are plenty of other mathematical constants that are just as beautiful and just as infinite as pi. Also, pi doesn't make sense, she says. The equation for the circumference of a circle is 2πr. Wouldn't it be simpler, she says, if we created a new constant that makes equations easier? Hart has jumped on the tau movement, which says that π should really be 2π and be called tau. In other words, instead of the angles of a full circle being equal to 2π, they would be equal to T.
"Every mathematician should care about the simplicity and beauty of the constants we choose," Hart said. "But students find it confusing when they're dealing with radians and they find radians to be so unnatural because we use pi radians. Whereas if we used tau radians, students suddenly find it very easy to say, 'Well, half a tau is halfway around a circle, 180 degrees. A quarter tau is a quarter of the way around the circle.' It's obvious. It's simple. If we're dealing with radians, we should be using tau, and that makes all the math much easier for everyone, not just students." But I remind Vi Hart that her name rhymes with pi, and that makes me question the sincerity of her opposition. "Some people might think there's a conspiracy there, that all along I've only been pretending to hate pi, but really I'm just trying to rally people behind the cause of pi through manufactured outrage," she said, adding that it's only a theory. It's also worth noting, however, that Hart also collaborated with math artist John Sims on a song they call the "Pi Day Anthem." To our ears, it sounds a lot like an appreciation.